NABF and NABO Super Featherweight champion Ryan "Kingry" Garcia (15-0, 13 KOs) will face his toughest challenge yet as he takes on NABA Super Featherweight Champion Carlos "The Solution" Morales (17-2-3, 6 KOs) in a non-title fight scheduled for 10 rounds in the lightweight division. The clash will be the main event of the Sept. 1 edition of Golden Boy Fight Night at Fantasy Springs Resort Casino in Indio, Calif.The action will be streamed live on Facebook Watch in the U.S. and globally on the Golden Boy Fight Night Page. 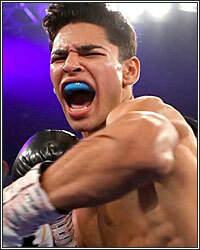 Garcia, a 19-year-old native of Victorville, Calif., is the future of boxing. After winning multiple national championships as an amateur and several professional fights in Mexico, Garcia signed with Golden Boy Promotions in Nov. 2016. Since then, he has won nearly every fight by knockout, including a highlight-reel knockout of Miguel Carrizoza to win the Junior NABF Super Featherweight Title and a first-round knockout victory against Fernando Vargas. In his last fight, Garcia scored a unanimous decision win against seasoned Puerto Rican contender Jayson "La Maravilla" Velez to win the NABF and NABO Super Featherweight Titles. The young star will fight a fellow regional champion in what will be his toughest test yet. "I feel amazed, honored and excited," said Ryan Garcia. "I've changed up my team and we've been working on my craft. I'm more focused now than ever before, and I've been working on the body shots. I won't reveal too much now, so everyone will have to tune in. I'm going to show fans why we are the hottest thing in boxing." Morales is a 28-year-old who currently resides in Los Angeles, California. Despite starting his career with a record of 0-1-3, Morales scored 16 impressive victories in a row, including a split decision victory against Charles Huertain 2017 that earned him the NABA 130-pound title. Morales then defeated Cesar Alan Valenzuela, a common opponent of Garcia's, before losing toAlberto "Explosivo" Machado in close and tough unification fight. Morales regained the NABA Super Featherweight Title late last year with a technical decision against Dardan Zenunajand will look to upset the rising star. "I am very excited to be back in Indio fighting for Golden Boy Promotions," said Carlos Morales. "This should be an entertaining fight. Ryan Garcia is a good fighter, and I always like to fight good opponents. This fight will be on Facebook Watch so that all my fans can watch it." Hall of Famer Marco Antonio Barrera will be the special VIP guest for this action-packed event. The native of Mexico City, Mexico is recognized as one of the best pugilists that Mexico has ever produced. In his legendary career, Barrera defeated the likes of "Prince" Naseem Hamed, Johnny "Mi Vida Loca" Tapia, andKevin "The Flushing Flash" Kelley. Barrera also had two spectacular fights against Manny "Pacman" Pacquiaoand participated in a legendary trilogy against Erik "El Terrible" Morales.Barrera will be in attendance for this event to meet fans, sign autographs and take pictures inside the Fantasy Springs Special Events Center. The meet-and-greet is open to the public with the purchase of a ticket to the event. In the co-main event, Marvin Cabrera (8-0, 6 KOs) of Los Angeles will take on hometown favorite Neeco "The Rooster" Macias (16-0, 9 KOs) of Lancaster, Calif. in an eight-round super welterweight battle. This will be a battle of undefeated boxers who are known for their aggressive styles. Garcia vs. Morales is a 10-round lightweight fight presented by Golden Boy Promotions. The event is sponsored by Tecate,"THE OFFICIAL BEER OF BOXING," and Hennessy, "Never Stop, Never Settle." The fights will take place Saturday, Sept. 1, 2018 at Fantasy Springs Resort Casino in Indio, Calif.